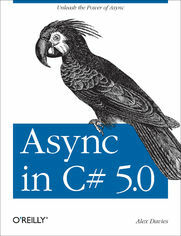 If you&#8217;re writing one of several applications that call for asynchronous programming, this concise hands-on guide shows you how the async feature in C# 5.0 can make the process much simpler. Along with a clear introduction to asynchronous programming, you get an in-depth look at how the async feature works and why you might want to use it in your application. Written for experienced C# programmers&#8212;yet approachable for beginners&#8212;this book is packed with code examples that you can extend for your own projects. Whats So Great About Asynchronous Code?